Every piece of plastic garbage you have ever thrown away still exists, on this planet, in our soil or our water. Every plastic container, food wrapper, and coffee cup. It is all still out there. We have all seen the pictures of dumps, teaming with junk. Or maybe you have seen the pictures of our oceans, littered with plastics and trash. We tend to think of that problem as someone elses, but all of that junk is ours. It's is easy to disassociate from these pictures. But that is your trash. Your garbage in the dump and the ocean. The wrappers from your food, the diapers from your baby. That terrible ugliness is yours. We love the term "throw away," but each day we are forced to see the truth a little bit more; there is no "away." It's all still out there, and now it is choking our oceans and killing our wildlife. It causes higher CO2 emissions, so waste is a key contributor to climate change as well. This is the battle of our moment in history. It's a huge, complicated problem, but it also start in your house, at your garbage can. That could cause a lot of guilt, OR you can use it as an opportunity. The things you have thrown away in the past may be invisible baggage you carry along with you. The empty purchases you have made, potentially made with the mistreatment of other human beings carries weight in our lives as well (even if we don't see it). But these are your choices so you have the power to change them. You aren't powerless. That's amazing. You have a chance to kick this cycle and to stop feeding our world full of toxic plastics. The question is how do you start? 1. BUY LESS STUFF- Waste and garbage is a byproduct of our addiction to stuff. The first and most powerful step is to simply stop buying so much and to choose things with less packaging every time. Shop the outside edge of the grocery store. Buy experience gifts instead of toys. All new clothes are shipped in plastic envelopes. All these things add up daily. Less stuff= less waste. Plus, this makes your challenge easier for you! The less you have, the less you have to figure out how to get rid of. Also, it makes life better. I know that sounds crazy, because we have spent our whole lives hearing that happiness is getting the things we want. But it isn't true, and you don't even need me to tell you that. So the trick is looking hard at ourselves and cutting back at the purchases we don't always resist well. 3. 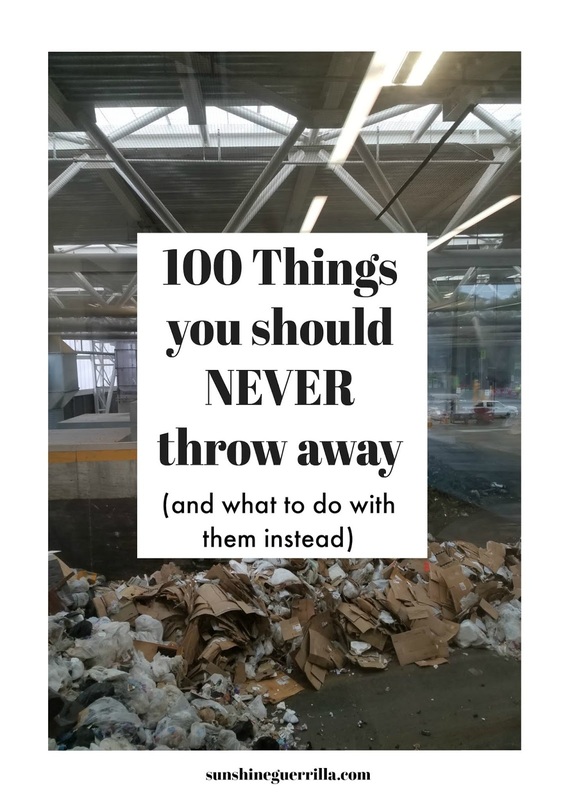 Find New Avenues- There are lots of things that get thrown in the trash that absolutely could be reused, recycled, or composted. But first you have to know all of your resources for discarding. Buy Nothing- The Buy Nothing Project lets neighbors ask for and offer items in their homes. You join the group in your neighborhood, and you can hand off anything you want to your neighbors, and they will come pick it up from you! Check out if you have a local group here. Green Waste or Recycling Services- Most neighborhoods still don't offer compost as a separate waste service with the garbage, but in lots of neighborhoods you can now pay separately for green waste or recycling. It's worth it! Thrift Stores/ Goodwill- People donate a lot, but there are things in your house you may be able to donate that you didn't realize! It may be worth it to check what your local places accept. Be sure to check what is local to you! In Seattle, we have a subscription service called Ridwell. 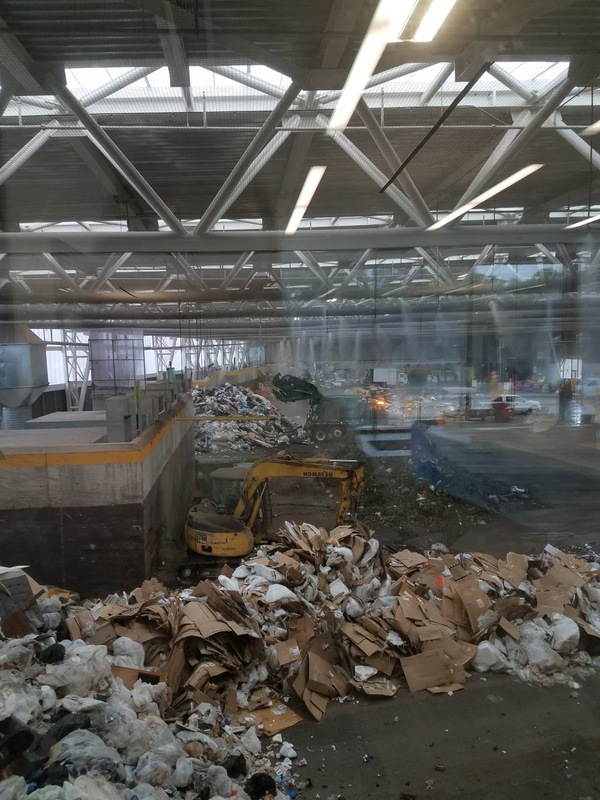 which takes special recycling- lightbulbs, batteries, plastic film, and textiles every two weeks, then they do other categories like styrofoam too. It is so cool! Just search for "recycling + your town's name" and see what you get. If you community isn't offering composting yet, do it yourself. You can buy a spin composter, a worm composter, or you can throw your scraps into the woods on your property (only half kidding here), but letting your food and yard scraps break down into soil is an absolute necessity. If you are feeling like composting is way out of your comfort zone, I think this post on what goes in the compost bin from Eco-Thrifty Lifestyle. We have been composting for a few years, and it is way simpler than it seems. And you get to save the world, so NBD there. Each of us lives a different life, has varying needs, and our own challenges. That's good. If your necessary medication comes in a styrofoam container, you don't owe anyone an explanation. If you live in a food dessert and have very few packaging-free foods to buy, then maybe you won't be able to limit there. If you have no yard, you probably can't compost. There is not a universal perfect answer for everyone! You have to do what works for you and what you can sustain. So my dream isn't that we all have the same goal, but that we each have A goal. Let's say, one garbage bag for your whole house for a week. If that's too easy, do for the whole month. Each of us have battles we can fight and ones we can't, but everyone can do something here. Set a goal to offer everything you can on Buy Nothing first. Just set a goal! It's about us all shifting our paradigm to let go of "away" and take responsibility for every object and scrap that comes through our possession. You can do this. Appliances- Washers, Dryers, Dishwashers, Stoves, and more can all be donated as long as they are still working. You can read all about where on this post. Baby Food Pouches - Honestly, I hate baby pouches, and I would highly recommend you just not buy them (check out this post for the MANY reasons why). Terrible for your kid, your bond, and the environment. That said, everyone has their own battles to fight, so if you do use them, NEVER throw the pouches in the garbage. They can ALL be recycled through Terracycle. Batteries – Batteries should always be recycled. Check out this post for resources on where to send your batteries. Blankets- Blankets, even if they are looking a little rough, can still be used. Wash yours and then you can donate it to homeless shelters or resource centers, animal shelters, or even your neighbors on Buy Nothing. Books- Someone else can read those books, whether it be as a gift or lent out by your local library. Here is our list of places to try to donate them. Bottle Caps- You may have to take these off before you send bottles away for recycling. Don't just throw them away! Consider how you could use them as crafts OR donate them to a creative reuse center. If nothing else, you can fill a box with them and send it to the Terracycle zero waste program. Bread Bags- The plastic bags your bread comes in can be recycled in a specific kind of recycling called plastic film recycling. You cannot leave it in curb recycling, but there is drop off recycling spots for these things. You can find good info on what applies here. Recycling is still a pretty temporary solution, so buying less food in plastic packaging is key, but we save up ours and drop it off every few months. Bread Tabs- While you are wasting less with your bread, know that those bread tabs shouldn't go in the trash either! They can be great for marking electrical cords. There is also an organization (based in South Africa) that collects bread tags to fund buying wheelchairs. I know it sounds crazy, but you can read about it here. We are hooking ours to our dish drying rack, and when we are full, I will send ours there. Brita Filters- Terracycle has a partner program with Brita Pitchers, so you can recycle the pitchers, filters, and dispensers. So none of us should toss those filters! Bubble Mailers- We tend to buy all of our books secondhand, and one of my pet peeves about that is that the books often comes in bubble mailers. NEVER throw these envelopes away. We tend to save ours, and then give them away in big chunks to neighbors who can reuse them through Buy Nothing. If this isn't an option for you, you could also check with book sellers or craft sellers you know. Someone can use them, and the more reuse they get, the better. Building Materials- Habitat for Humanity has opened reStores all over the United States, and these secondhand building supply stores are absolute gems. You can support their mission, get a huge deal on things you need, and keep building supplies out of landfills. If you have leftover stuff, this is how you give it away. Cars- Never just take a car to the dump. 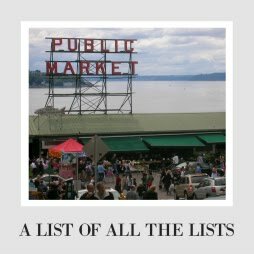 Here is a long list of places that will take it from you as a donation to support their mission. Cardboard Boxes- We probably give away 30 cardboard boxes a year on Buy Nothing. People are always moving, and they always need moving boxes. When you have a lot of boxes, consider offering them to neighbors first, recycling second, and never throwing them away. CD and DVD Cases- No need to throw these away- someone can use them! The creative reuse center I work for use old cd cases for art projects. Need more ideas? Check out this post for resources on how to find reuse for these. Cell Phones- When I did the research, I was blown away by all of the amazing reuse and donation opportunities for our cell phones. That old phone you would throw in the trash absolutely has another life left in it. Cigarette Butts- Ok, prepare to get your mind blown. Terracycle has a program for cigarette butts, so no one needs to toss butts (theirs or other's) ever again. We know that cigarette butts are the number one source of pollution in our waters, so having this program (and putting it to use) could literally change the world. You can even get Terracycle receptacles for your cigarette butts. Coffee Bag Ties- Much like the twisty ties from produce bags (which you never need, so just don't), these little wires have tons of reuse possibilities, from keeping Christmas lights untangled to holding something together while glue dries. Keep them with the rest of your tools, and you will be surprised that they do turn out to be handy. Coffee Filters - About a third of what goes into landfills each year is paper products, but like any plant-based material, they can be composted. If you use paper coffee filters, then you can throw the grounds and filter into your compost (pretty amazing when you consider how much waste those "efficient" Keurigs make). You can read more about it here. 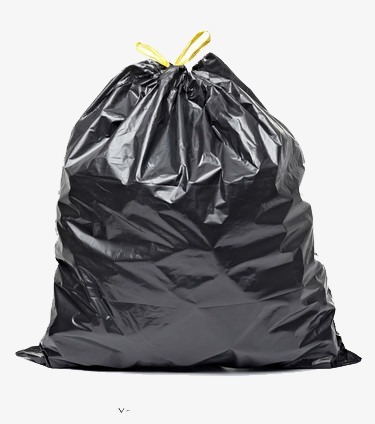 Clothing (Even Worn Out Stuff)- The average American throws away 65 pounds of clothing every year. About 70% of that ends up in landfills. What!?!?!? This is particularly shocking because we don't need to throw even 1 once of textile waste away. 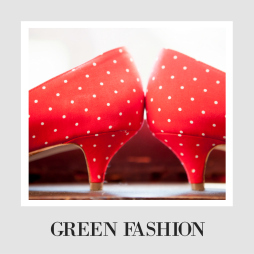 First, we all need to opt out of the churn of fast fashion. It creates so much waste, and if it were going to make you happy, wouldn't it have done it by now? Second, we can reuse some clothing as cleaning rags, and wear them down to nothing. Lastly, donate. Donate the things that just aren't for you and donate the things that have pilled. There are reuse opportunities for both, and you can read about all of them here. Just NEVER throw it away. Dishes- If you have dishes you don't need anymore, someone else can use them. Offer them on Buy Nothing if you have one (they always go fast). Otherwise, here is a list of ideas of where to donate them. Disposable Gloves- Work in a restaurant, medical center, or research space where lots of disposable gloves are used? Cut way down on waste by investing in a Terracycle zero waste box for gloves. These zero-waste programs are not cheap, but they can really cut down on the waste you create! 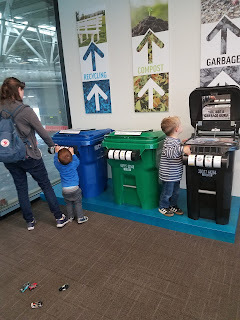 Terracycle has a disposable garments program too. Drink Pouches- Like so many things on this list, this waste can be easily avoided by just not buying them in the first place. These pouches always squirt juice out of them anyway! That said, everybody has their battles to fight, and maybe these really solve a problem for you. If so, consider this Terracycle program to keep the pouches out of the landfill. DVD's- You may think no one would be interested, but local shelters or homes might be so grateful for these as gifts. Or you can check with your neighbors on Buy Nothing! If you want more ideas, check out this list. Egg Cartons- Egg cartons can be reused in hundreds of ways, from seed starters to paint palettes. Also, if you buy the paper ones (such an easy way to get a piece of plastic or styrofoam out of your life), they can often be composted (it should say on the packaging). So, reuse, and when you can't reuse, compost. Electronics (NONE OF THEM) - All electronics can be recycled or broken down for recycling. In bigger cities, there are usually electronic places that buy your stuff (just be sure you really clear all your data and such first). If you don't have a recycling or buyback program near you, you can still recycle all of your smaller sized electronics (basically laptops and smaller) through this program at terracycle. Anything that can't be reused is melted down into recycled plastics. Exercise Equipment- You can donate or recycle most exercise equipment. Check out this post for ideas on how. Eyeglass Cases- This is another good one to offer to your neighbors on Buy Nothing; someone might be in need of a box! If not, there are also lots of ways to reuse these. I love this post, that has tons of fun ideas. Febreeze Stuff- If you are a Febreeze fan, they have a recycling program through Terracycle for their products and packaging. They have a separate program for their aerosols as well. Flonase- Flonase has a recycling program with Terracycle, so if you use these, you can recycle them. Food Scraps- Compost them! A banana peel throw in compost will decompose in one week. Thrown in a plastic trash bag, surrounded by plastic trash, it may never decompose (and even emits way nastier chemicals). Compost them. If you aren’t composting yet, this is an awesome, easy green step to take. Depending where you live, you could also put your food scraps outside for animals. Food never belongs in the garbage. Furniture- NEVER throw old furniture away- even if it is a totally tragic couch or some really out of style terribleness. If it is functional, then someone can use it. The first person on that list is you- could you paint it? Refinish it? Upholster it? If something isn't your style, get creative and make it your style! Sometimes you can get 10 more years out of something simply by changing your attitude to make it last. If that won't work, check with your neighbors! The beauty of Buy Nothing is that you get rid of something and the person who gets it will come and get it, so you don't even have to worry about transit stuff. Also, you can donate or consign most furniture. Glasses, Mugs, and Cups- There are so many mugs in this world. No one should ever buy one new, and no one should ever throw theirs away. If your cupboard is overflowing, check out this list for ideas of where to donate. Greeting Cards- If you cut the top off of greeting cards, you can attach it to a recycled paper greeting card (we like these ones) for a quick and easy reuse project. Then you can usually recycle the bottoms. So simple, and you can save tons of money too! The other AWESOME option is to send your card tops to the St. Jude's Ranch recycled card program. It was on hiatus for a bit, but it is back, and you can mail them your cards to be reused AND raise funds for the families of kids with cancer. Hangers- Wire or wood, this is a perfect thing to offer neighbors OR hand off to your favorite dry cleaner. You can read all about it here, but unless it is broken, these are easy to find a new home for. Holiday Decorations - Someone near you can use the decorations you are ready to retire- check with young family members who are just starting out, post them on your Buy Nothing group, or donate it to your favorite thrift shop. Don't throw that stuff away, and if it needs fixed, just fix it before you hand it off. Keurig Cups- You should give up the old cups for reusable ones (so easy! And it will save you money), but if you are in a work or home environment that is creating a lot of waste with these cups, you can send them to the Zero Waste Terracycle program. Laundry Detergent Bottles- Terracycle has a free program for fabric care recycling, though that one depends on where you are. 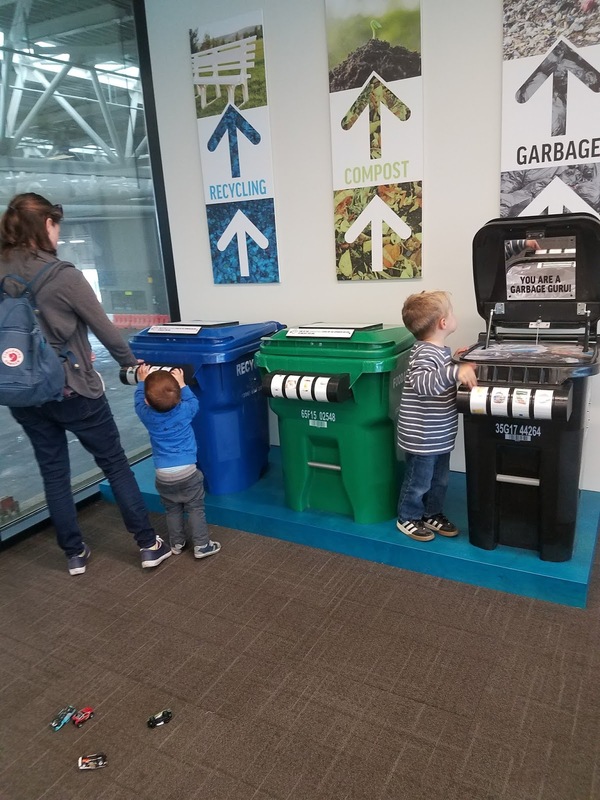 Green companies like Seventh Generation are also playing with new packaging ideas where everything can be composted or recycled easily, so that may be worth trying. Mailbox- We had to switch ours out for one that you couldn't steal mail from, and a mailbox turns out to be an epically great toy. If you don't live in a home with someone who would appreciate that, maybe check with the preschools in your area? Depending on how old it is, it might be suitable to sell to a thrift shop too. Markers- Crayola has a recycling program for all of their markers. You can read all about it here. In my dreams, every school in America has a bin to send their dried out markers back. Milk Jugs- It may seem better to get milk cartons instead of milk jugs, but most milk cartons are lined with plastic inside, and are therefore impossible to recycle. So go with the jugs (unless you have glass as an option where you live), and worst case scenario, you can always clean them out and recycle. But before you get there, consider the many reuse opportunities these jugs have. Awesome for crafts, experiements, water storage, and more! Packing Peanuts- Honestly, packing peanuts shouldn't even exist anymore. Biodegradable starch-based peanuts have been available for years, so if someone ships plastic ones to you, the first step is to complain. Seriously, companies only know we care if we speak up. You cannot recycle them curbside, but you may have packing peanut-specific drop off days near you or you can recycle them through Terracycle. Another option is to go to shipping places near you and offer them for reuse. Paper Towels- You can cut way down on waste by getting reusable unpaper towels, but used paper towels (with food waste on them, not nasty cleaning chemicals) can be composted. Unpaper towels are not that expensive, and we have been using the same ones for multiple years, so it saves us a bunch of money. Pill Bottles- I am waiting for the day that all pharmacies accept pill bottles back for reuse (seriously? Anyone else wondered why this isn't a thing already?). Until that happens, you can send your pill bottles to Matthew 25: Ministries, who send the bottles to medical practices in developing countries. There are also SOMETIMES special drop off days for pill bottles at recycling centers, but that can be hard to come by. Plastic Food/Coffee/Yogurt Containers- Why do you throw your yogurt containers away and then spend money on plastic food containers from Tupperware? It makes no sense! The dream is to stop buying our food in plastic packaging, but if you have something you can only get in plastic, get creative about how to reuse it in your house. In our house, we used old formula containers to organize the tool bench, my art supplies, and even toys. Old yogurt containers (we buy the big ones) are used for food storage, beach and backyard toys, and as a way for my students to take their art projects home. The longer you can extend the use life of this stuff (and avoid buying more plastic), the better. Plastic Wrap- This goes into the plastic film recycling! And you can cut way down on this waste by using reusable bees wraps or bowl covers like these instead. Plus they make me laugh because they look like old lady shower caps. Recycling is good, but reuse is way better, because plastic can only be recycled a few times before it is too brittle. Plastic Grocery Bags- The best way to avoid tossing plastic grocery bags is to not have them in the first place. Get reusable cotton bags. If you have them, they can be good to reuse as garbage bags in your home or they can go in plastic film recycling. But, really. No more plastic grocery bags. And if the stores you shop at still have them, it's time to step up and complain. Plastic Produce Bags- Best option? Just don't use them! Your apples and oranges can mingle just fine in a larger reusable bag OR you can use the paper bags often snuck in near the mushrooms. If you like having a produce bag, I highly recommend these bags from ColonyCo. They are the best reusable bags out there. If you do have plastic produce bags, put it in your plastic film recycling. Scrap Wood- Save any and all wood for your ow reuse or donate it to a Habitat for Humanity reStore. Shampoo Bottles- You can avoid a lot of the waste in your bathroom by switching to bar soaps and shampoos or trying a refillable shampoo like this one from Plaine Products. If you do have beauty bottles to get rid of, try using this Garnier and Terracycle recycling program. Silverware- Yep! Donate it! Hopefully, we will all reach a place where mismatched sets (especially for people starting out) is totally commonplace. Check out this post for places to give away even your odds and ends of silverware. Socks- It’s hard to do better for a cleaning rag than a sock. When you have a loner, don’t toss it, throwing it in your cleaning rags. The next time you need to dust, turn it inside out and clean. They work perfectly for this, and then that poor sock has a longer life. Stuffed Animals- Everyone! Stop buying new stuffed animals! I speak for all parents when I say our kids have enough. We've all made this mistake, but now it is time to stop. That said, if you have a bunch that need a home, I have a whole post on how to pull that off. Styrofoam- We should all avoid styrofoam where we can (looking at you, fast food restaraunts in the South), but sometimes it is out of your control. NEVER throw it away. Sometimes there is a recycling center near you that accepts it, in other areas they have special recycling days when you can take it. The best info I could find on this was here, but it's worth it to do research on your own area. If you have no options, you can send it to me and I will recycle it for you. Do not throw it away. Tires- First, think about reusing them! There are tons of awesome tire reuse ideas, from planters to compost bins. sandboxes and way more! If not, Earth 911 has helpful information on how to recycle tires. Tires cause major problems in landfills, and over 300 million go into landfills a year, so we need to stop this trend and recycle instead. Tissues- As long as you are using recycled paper/bamboo ones (not with lotion or plastics in them), you can put tissues in your compost. Toliet Paper Tubes- Another perfect craft material! If you don't need them for your own crafting, ask around to the schools, Sunday schools, and daycares near you. Donate them to a creative reuse center near you. Or send them to me, because this art teacher ALWAYS needs them. Since they are paper-based, you can also throw them in your compost. We are in the habit of just throwing these away, but don't! Toothbrushes- My big advice here is to switch out your conventional (plastic and chemical-laden) toothbrush for something made of bamboo or recycled materials. But, if you are still using old toothbrushes (or you work at a dentist office and want to do some good for the world), consider recycling them through the Colgate/Terracycle toothbrush recycling program. Toys (even the jankiest ones)- Early in our parenting journey, we got a little plastic treehouse with a ramp from a neighbor. It was already missing parts, and there was a hole in it. It has been one of the most beloved and played with toys to ever grace our home. And I bet Goodwill could have mistaken it for garbage. Give toys to neighbors, consign them, or donate them. Even janky stuff may be beloved by another kid. VHS Tapes- Yep, you can donate a lot of these too. It turns out that lots of spaces still use VHS. 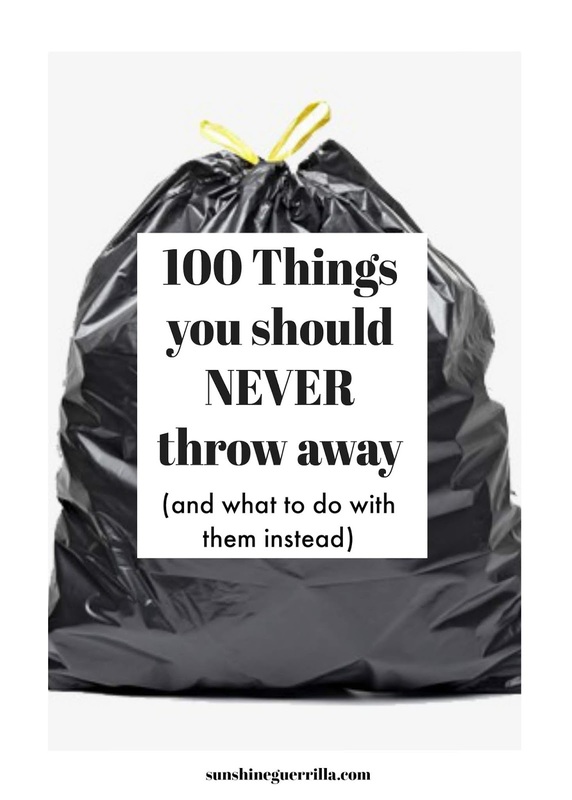 Check around before you toss them, and check out this post for ideas. Wedding Decorations- Don't throw your wedding stuff away or leave it to collect dust. You can offer it to neighbors on Buy Nothing or wedding-specific Facebook groups. There are also lots of spaces to resell your wedding decorations- ruffled, Tradesy, Wedding Recycle, and even Ebay. Even if you don't have a lot, it may be enough for someone else. Wedding Dresses- We often go back and forth about whether to give this item away (myself included) but it is amazing how many people intentionally ruin a wedding dress either in a "trash the dress" type of photoshoot or after a hard break up. Just don't. Trash the dress is cheesy, but supporting military brides is pretty awesome. Check out this post about all the cool ways you can donate your wedding dress. Windows- If you get your windows redone, ask the window company what they do with the old ones before they send them away. If they don't have a sstem for recycling, then you can do better. The best first step might be to offer these on Buy Nothing as a craft tool, or to take it to a Habitat for Humanity reStore or another Building Supply reuse store. Even a window that seems outdated might make a great frame. Wine Corks- These are also well-loved craft supplies, so if you craft, keep them! If you don't, track down a creative reuse center near you to donate to. This is the best list I could find, but I know the list is outdated. If you want to go this route, be sure to research what is near you. You can also recycle them through a Terracycle program. Whoa- that was a lot of work! But remember, everything we can keep out of landfills is a huge win for the environment. 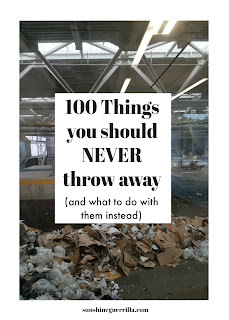 Even more importantly, the best way to avoid waste is to stop buying so much in the first place. Try secondhand to be packaging-free! And go join your Buy Nothing Group- it's a game-changer! Want to donate instead of trash this year? Awesome! Our goal here is to give away 2,019 things in 2019. Want to join in? We recycle as much as we can and I make eco-bricks and we have a compost heap :) We try to be conscious about what we use and what we throw away. Very interesting. I knew about some of these, but not all. We do compost in our household, and I even compost things like coffee filters and tissues. I thought I was doing a good job at recycling until I looked at your list. There is so much more that I can and should be doing! I am going to bookmark this page so I don’t forget! This was such a good read. I need to be better about recycling!